This charming example of century-old architecture reveals the intricate railings and wood trim that made homes of that era so picturesque. Built in the 1860's, it was used as the Savage Mining Co. office, and later, as the mine superintendent's home. 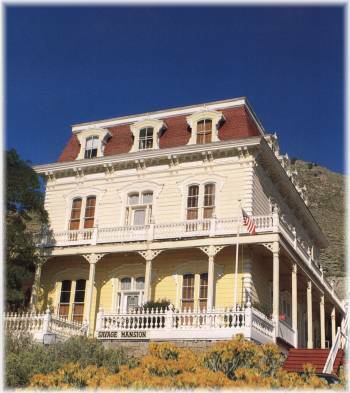 The Silverland Inn & Suites offers 68 rooms and suites in the heart of Virginia City. Elegant Victorian splendor awaits you in the victorian lobby, indoor heated pool, spa, gym and fitness center. Awaken to a free continental Breakfast in the comfortable Ramada dining room. You may choose from a variety of deluxe and tourist hotel/events packages. Please give us a call at 775-847-4484 for more information. The Comstock Park company hosts a 19 acre arena behind the Ramada Hotel. The facility is ideal for rodeos, livestock shows and events, concerts, gem and mineral shows or just about anything your association or club could consider. Silverland USA and the Comstock Park Co. welcome the spectators and participants for the use of our facilities at the ramada Hotel and comstock Park arena. The Comstock Park Co. will soon be opening a saloon/casino, fine Victorian style restaurant and spacious meeting rooms on the Arena Level of the Ramada Hotel. The Marshall Mint and Museum, locate on the Main Street in Virginia City, 96 North "C" Street, allows visitors to see the Mint Press in operations where the Angels of the Day, Miracle Medallions, Nevada State Ingot and many other minted products are produced and put in gold and silver jewelry. The mint also features a full line of custom gold and silver coins, nuggets, collector coins and beautiful amber, turquoise, amethyst, garnet, Victorian marcasite and other vintage style jewelry items. A world class gem and Mineral museum is available to see free of charge.